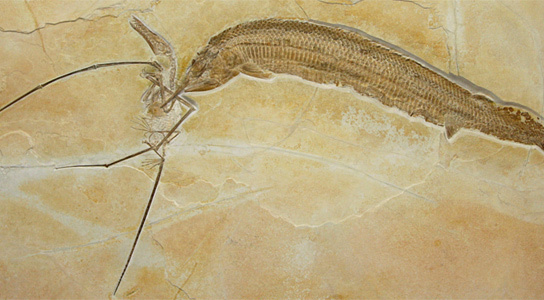 This incredible fossil, depicting a pterosaur in the process of being devoured by a ganoid fish, was recently showcased in a new study published in PLoS ONE. Pterosaurs aren’t dinosaurs, but flying reptiles of the Mesozoic era. Most of the fossilized specimens come from the Middle Jurassic to the Early Cretaceous periods. Many of the soft tissue features of pterosaurs can be reconstructed today, but the food and feeding habits of these vertebrate flying animals remain speculative because fossilized intestinal contents are exceedingly rare. For the first time, the study reports the unusual association of the predatory fish Aspidorhynchus and the long-tailed pterosaur Rhamphorhychus from the Late Jurassic which was preserved in Solnhofen Limestone, in Bavaria, Southern Germany. Predator and prey; the final meal of a Rhamphorhynchus is still sticking in the pharynx. The straight vertebral column and the closed tail fin, which is orientated towards the mouth cavity suggests that the ?Leptolepides was not regurgitated during the agony of the pterosaur. Furthermore the prey does not show any trace of digestion. A) photograph of the specimen WDC CSG 255 showing the position of the ?Leptolepides in the throat of the Rhamyphorhychus. To the right hand side the skull of the Aspidorhynchus is visible. B) line drawing of (A), C) close-up of ?Leptolepides under filtered UV light: 1 caudal fin, 2 neural spines, 3 vertebral column. The fossil proves that Rhamphorhynchus was the prey of Aspidorhynchus, and because of lethal accidental interaction, both perished. Four additional Rhamphorhynchus specimens have been found entangled with large Aspidorhynchus. None of them proved that Rhamphorhynchus was alive at the time of capture, which is what this fossil proves. This behavior of the Aspidorhynchus is supposed to be typical of that era and it is somewhat reminiscent of great white sharks jumping out of the depths to catch sea-birds in South African waters. 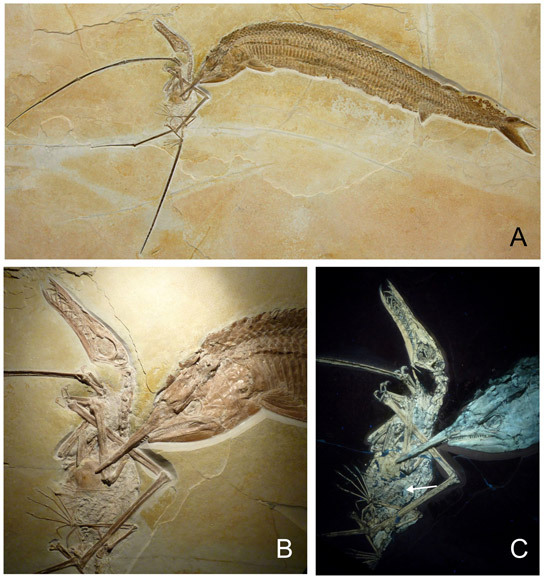 Fossilized hunting scene; A) specimen WDC CSG 255: an Aspidorhynchus and a Rhamphorhynchus in fatal encounter, B) section of the specimen showing the way both animals are entangled. Note that the jaws of the Aspidorhynchus did not get hold of a bone, but apparently of the flight membrane of the left wing. The distorted left wing finger is suggestive for this. C) A similar section under UV light, the arrow marks intestinal contents consisting of digested fish remains. 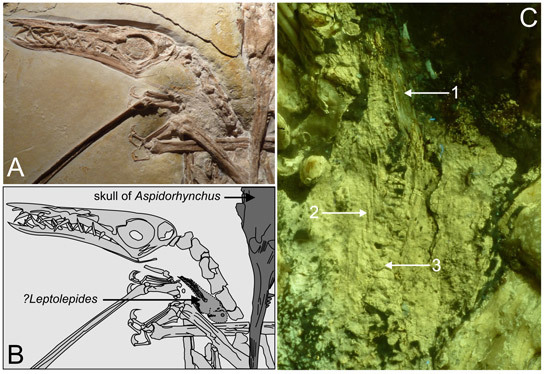 Be the first to comment on "Pterosaur Rhamphorhynchus Being Eaten by Ganoid Fish Aspidorhynchus Fossilized"